The Okee Dokee Brother’s have done the impossible and made the winter months fun! Check out their fantastic stroll through the colder months: Winterland! John Prine (that old so-and-so) is back in action with his first album of new material in 13 years. It’s a quirky cool drink of lemonade that’s perfect for shade sittin’ on the cusp of summer. What’s in the water in Sweden? I can’t answer that… but as long as First Aid Kit keeps drinking it and making beautiful music I guess I’m ok not knowing. FAK’s newest album “Ruins” is my Pick o’ the Week… #checkitout. Nathaniel Rateliff and the Night Sweats: Tearing at the Seams is Musical Musing’s premiere, numero uno, debut, very first ever Pick o’ the Week! Enjoy, and let me know what you are digging on this album! ***3 Albums was a semi-regular music series I wrote for the Topeka and Shawnee County Public Library between July 2016 and January 2018. Holy Smokes and Auld Lang Syne! Look around folks, we’ve unbelievably made another full trip around our star. Congrats! You made it to a fresh new year. 2017 was a year that didn’t pull any punches. It hit us with everything it had. As I spent the year writing about beloved music for you all, I kept being reminded of the high-octane undaunted power that music holds for us. It comforts. It strengthens. It freely gives endless repeating amounts of joy with each listen. John Cusack/Say Anything style! Boomboxes up! If it serendipitously happens to be a track 1 on a brand new album then it’s infinitely more exciting… because just maybe, if the magic can hold out for 10-12 songs, you’ve found a new kindred spirit. Humming House’s previous album Revelries held a lot of promise and put them on my radar. They have an interesting mesh of genres that keeps them from being too easily pinned down. You think pop-rock or indie folk but then they will throw a mandolin/violin combo at you and you have to reevaluate. I dig a band who firmly knows who they are but can still keep the listener guessing. Companion is an album of pure positivity. Luckily it’s not the over-the-top kind of annoying positivity. (We all know that one person who is just TOO positive). No, Humming House has a contagious kind of joy and optimism. You feel good while they bounce ’round the room in “Takin’ Over” or while they head out into the pines for some peace of mind in “Sign Me Up.” Even in it’s darkest contemplative moments there is a glowing thread of unrelenting hope that winds through the tracks of Companion. And man, unrelenting hope is a much needed, perfect theme for the onset of a new year. Give this one 10 seconds and let Humming House win you over in 2018. Money back guarantee if you don’t like it! *Rimshot* (Library joke, folks… cause… uh… you see… it’s free… to check out). It’s dang near criminal that I have reviewed 36 albums for this series and not a single solitary one of them has had “Josh Ritter” on the front of it. Seriously, break out the tar and feathers. I deserve it. Josh Ritter’s music is in my bone marrow. Some artist’s songs feel more like heartbeats. So elaborately interwoven into your own life experiences that there aren’t proper words to describe the relationship. I’ve followed along with Josh’s words and sounds for 13 years now and never have I been more proud of him then when I first heard the storm-laced sounds of Gathering. Josh Ritter is an artist who refuses to plateau. Each new album finds him reaching higher and making better art. 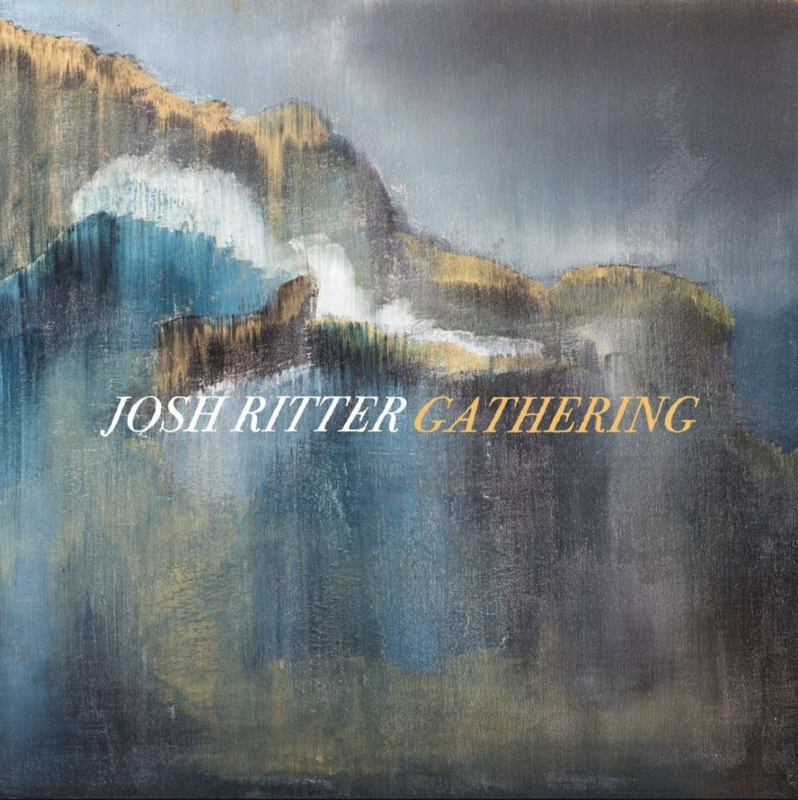 So, Gathering is a one of America’s greatest living songwriters at the peak of his game. Woah! That sounds serious and I mean every darn word of it. He’s the real deal. Josh is an old soul. He doesn’t write songs he spins yarns. He rolls like a tumbleweed through forgotten times and spaces. He puts on a new hat every song, sometimes he’s the villain sometimes the hero. He is the best-spitfire-rapid-delivery-songwriter out there and he turns words and phrases that no one else would ever think to put into song. (Find me another songwriter sneaking in stuff like: “I took off south like the beat of a bat wing,” “I’m the favorite of babies and society mavens,” “nasturtiums,” and “wisdom Solomonic”). When you grapple with keeping resolutions, songs like “When Will I Be Changed” and “Train Go By” will be a comfort. When you think about leaving the past in the past, songs like “Friendamine” and “Cry Softly” will help you let go. When you laugh at all the absurd and interesting people that cross your path each day, songs like “Showboat” and “Oh Lord, Pt. 3” will curl your lip upward. When you forget how much love is all around us, songs like “Feels Like Lightning” and “Strangers” will fill your heart. “All my life before I met you when I was trying hard in love. By far, the most disappointing musical moment of my 2017 involved Beck. However, it had nothing to do with the infectious, dancable, celebratory album Colors that he released this year. (More on that later after I share my epic sob story). I had heard that U2 was touring on the 30th anniversary of their iconic Joshua Tree album and they would be stopping at Arrowhead Stadium in September. No doubt this would be a spectacular concert. It’s U2. It’s the Joshua Tree. No Brainer. Still, I was on the Edge (Pun intended – ZING!). I saw U2 back in the early oughts and it was a magical concert experience. The past decade has pulled me away from fervent fan status with the Dublin rockers. I still gots U2 love, but it’s gravity has lessened. Then Beck slipped into the opening slot on the Arrowhead ticket. Beck has been on my mental-concert-bucket-list for a long while, so coupling him up with the closest I’ll ever come to a late 1980s U2 concert pushed me several light years over the fence. I’m all in! My wife and I grabbed up some nosebleed tickets, invited some good friends and anxiously anticipated an arena-filled evening of audio awesomeness. Then a whole bunch of anti-awesome things happened. Work schedules had us running late. We’re the type of folks that prefer small venue concerts so we are rarely trying to get to concerts that cause traffic jams. Oops. Beck started his set while we were creeping slowly down the highway. We miraculously got parked as Beck was finishing his first song. We could hear him drifting over the top of the stadium like a muffled radio. We ran-walked to the entrance: wrong entrance (floor seats only). We ran-walked halfway around Arrowhead to the cheap seats entrance. This is when a ticket taker made my very pregnant wife cry. Seems her across-the-body purse style was considered a bag and couldn’t be admitted. (C’mon man! It’s the smallest purse this lady has ever owned!) My wife sits sobbing as she jams into her pockets all the stuff a very pregnant lady might need in any given 3 hour period. I try to console her and tell her to go in with our friends. I sprint back across the parking lot to deposit this “bag” in our car. Since we are now on the opposite side of the stadium and I am already beyond panicky… I’m soon lost in a sea of cars. None of which look like mine. I hear strains of “Soooooy un perdedor” drifting out over the parking lot and I relate. Hard. It was a facepunch to the gut of my heart. I understand those words don’t make sense when placed together, but just let me feel my feelings! Of course, U2 put on a great show. The night still ended up being pretty good. (Despite the fact that seated directly in front of us was the only guy for miles who felt it necessary to stand and sit 5-10 times throughout the course of every song). Beck was kind enough to leave me with a great album to soothe the sadness of my botched concert attempt. Colors is a sharp departure from 2014’s Morning Phase. Beck lets it all loose in a flurry of foot tapping ear worms. He keeps his wonderful quirkiness fully intact while simultaneously putting out one of his most accessible albums. He name-checks Topeka in “I’m So Free.” It makes me happy. You don’t hear us showing up in songs that often. I mean, the classic traveling song “I’ve Been Everywhere” name-checks no less than 91 towns, 5 are in Kansas and it still misses us! I’ll keep a Beck concert on the bucket list and for a while I’ll keep Colors in heavy rotation. It’s got the spirit of a New Year’s Eve celebration and that’s the kind of thing that fades too quickly as life keeps rolling on. Happy 2018 audiophiles! I wish you all health, happiness and many great new tunes in the year ahead! It feels like forever and a day since I got behind the keyboard and waxed musical with you fine folks! I’ve been waylaid by some pesky use-it-or-lose-it vacation time and the tending to of other top secret library matters. (Sounds important, right? Mostly it’s just putting stuff people want into their hands… which IS kinda important!). While I’ve been away, this blog series managed to hit a nifty milestone: 3 Albums recently turned 1 year old! Y’all sound positively marvelous. Thank you to the two people who humored me by actually singing awkwardly at your computer and/or mobile device screens. (Mom and Dad, I’m looking in your general direction). The fact that I’ve been writing a music series for more than a year now sometimes makes me chuckle to myself. Occasionally like a maniacal cartoon villain, but more often just the garden variety laughing lizard meme “hhhehehe” kind of laugh. I say this because although I do devour a lot of different music, I tend to be behind the curve in many ways. Not exactly swimming in the mainstream. Perhaps not the most likely choice to be telling people things they should be listening to. My moth-to-the-flame draw to quirkiness. My interest in songwriters over radio friendly pop icons. Unique Christmas music and my obsessive compulsion to seasonally theme my listening. But hopefully my odd place on the bell curve has aided you in discovering some new tunage or at the very least given you the inspiration to keep searching out sounds you love. So let’s do just that: dive into the far end of the bell curve and find you some new audiowaves! Arcade Fire is a primo example of my life on the slow side of the bell curve. Very few bands of the modern music era have enjoyed such immediate and sustained critical and commercial acclaim. Every note this band has played since their debut album in 2004 has received praise that is as dang-near universal as a mortal band could hope for. Which is why it is not surprising that the first Arcade Fire album to really thunderbolt me would also be the first one in their acclaimed discography that has drawn the dreaded “mixed reviews.” This actually sums up my musical sophistication pretty spot-on: Late to the party… and it’s not even the awesome party that everyone’s raving about. Not that I haven’t tried my darnedest to love this band. Their past albums have just never overwhelmed me like they did other people. Nor did they underwhelm me, they simply whelmed me. But this year’s release Everything Now hit my bright red bullseye. It’s the spaghetti that finally stuck to my wall. It’s about having too much and still wanting. It’s about an ever connected world feeling claustrophobic as it closes in on us and dictates our choices. It’s about having too many choices to pick from and whether or not that’s a good thing. Arcade Fire deliver their social commentary in tight, well crafted and sometimes brilliantly executed audio gifts. I think part of the reason this album wasn’t as well received is that they became a little more musically adventurous on this album. Genres leap-frogging all over the place from track to track, which to me helps reinforce their overall statement. Sometimes diehard fans have trouble with “different” and that may be where the disconnect lies. It doesn’t quite feel/sound like normal Arcade Fire fare so it’s harder to still see their brilliance behind it. But trying new things is how good bands grow and acquire new fans (Like me!). There’s a killer pan flute sample in the swirling title track “Everything Now.” (How often in life does one get the chance to utter the phrase “killer pan flute sample?”). The bass work this album is fan-dang-tastic fun. I read a review that called “Chemistry” the worst Arcade Fire song ever… but I just gotta say: Dat bassline tho. There are two back-to-back tracks called “Infinite Content” and “Infinite_Content.” It’s a gag to prove a point about our Netflix’d existence where everything under the sun is at our disposal. I won’t give it away, but I laughed out loud when I put it together their use of genres. Point well made, Arcade Fire. What do you think? Am I way off base in my love for this album over their others? Perhaps. But that’s life out on the curve for ya. I’ll continue loving what I love (and secretly hoping you do too!). If you were a fly on my bedroom wall circa 1995 you might be curious why my ear is pressed against the wall as I stand precariously perched on my bed. I never owned the Offspring’s breakthrough album Smash, but my brother sure did. Since I am ninja-sneaky/a typical little brother that definitely means I often slipped into his room while he was gone and “borrowed” many an album. Meticulously replacing it when I was done listening (Belated apologies for this privacy invasion, Todd!). I have to pause and give mad props to one of our Collection Developers: Perry Hartmann. He does a stellar job curating the library’s music and movie collections. I especially love that he routinely sneaks some older gems in with the new stuff. When I saw Smash on the “On Order” list I cracked a huge teen-aged sized smile. Don’t you love it when a lost musical friend from your past pops back in to say “Hey”? Listening to Smash now more than 20 years later feels like a strange sort of homecoming. I know every track just like I knew exactly how to perfectly re-stack Todd’s CDs every time way back in the day. Smash is a powerhouse album. Anchored solidly by the smash-hits (pun intended) “Come Out and Play” and the ode to self-loathing, “Self Esteem.” It boils over with youthful angsty energy and Pop Punk sing-alongs (My fave is the “Woah-OO-oh! !” in “Something to Believe In”). “Bad Habit” also includes the most cathartic (albeit absurdly inappropriate) string of road rage expletives ever recorded. (Put the earmuffs on the kiddos for this one! Well, actually for the whole album!). Of course, the album is not without it’s missteps. “Killboy Powerhead” sounds precisely like a strange throwaway track you would expect from an unknown early 90’s rock band. Which, to be fair, the Offspring WAS an unknown early 90’s rock band when it was recorded. But on the whole this album holds up to the years. I always like backtracking to those pinpoint albums that propel a band into stardom. They are always so raw and honest and full of promise. I feel like a lot of bands never can tap back into that well once they break through. Maybe that’s kind of what happened to The Offspring in my eyes. They went on to have a string of hits after Smash. They were pretty fly singing “Nah nah why don’t you get a job!” But in my ears this would always be the album that they never were able to match. Slide down the curve into this 1990’s time machine that’s primed and ready for your ears. And we’re loved everywhere we go. Question: Is it cheating to recommend a Greatest Hits album? Answer: (Since I’m making the rules here) “No!” because Greatest Hits albums can themselves be great albums (Duh Kyle, it’s in the name) and they can also spur on musical discoveries. This was another album I came across while perusing the library’s recently purchased selections (A great way to find and take risk free serendipitous chances on new music). They had a huge hit about being on the cover of the Rolling Stone that actually led to them being on the cover of the Rolling Stone. That song was penned by beloved quirky children’s author Shel Silverstein. That’s it. Literally all I knew. I wasn’t alive in the 70’s, so I missed out on the fact that Dr. Hook actually had a pretty good run during that decade. Unfortunately, time has whittled that run down to mere one-hit wonder status but I was pleasantly surprised to get some education on the remainder of Dr. Hook’s hooks. This is where the power of the greatest hits album lies. I often wonder what music I would have been listening to if I was alive in certain time periods. Would I have been a fan of the light-rockin’ Dr. Hook jams or would I have been Led-Zeppelin-heavy or bust? Hard to say for sure, but my 2017 self thinks this funny band of freewheelin’-hippie-looking-fellas would have been right up my musical alley. I mean, they’ve got a member who sported an eyepatch for goodness sakes! I’m in! They clearly don’t take themselves all that seriously. “Cover of the Rolling Stone” is perfectly delivered and hilarious but to my surprise they actually had a long working relationship with Shel Silverstein. He wrote many of the tracks on this album and this band lands his quirky offbeat humor every time. They’ve got more then just one side. Though their humorous songs are pitch perfect (“Sleeping Late” is an ode to a pillow) they can also do serious (“Carry Me Carrie”) or love sick (“Sylvia’s Mother”) or just plain groovy 70’s (“Walk Right In”). “Carry Me Carrie” has one of those great breakdowns at the end where the singer just short circuits in the emotion and goes all vocally haywire. Think Paul at the end of “Hey Jude” screaming “Jude-ay-Jude-ay-Jude-ay-Jude-ay!” #winning. While I’m waaay beyond the time curve on this one, I’m glad Dr. Hook finally came around my way.